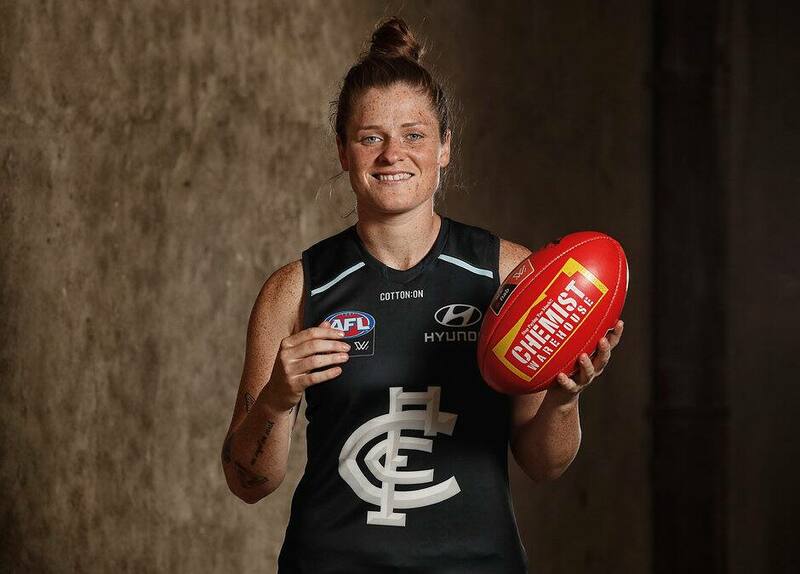 CARLTON is set to unleash AFLW captain Brianna Davey in a new role up forward this season, with the Blues hopeful of creating a powerful three-pronged attacking unit that will bring a more potent game-plan under new coach Daniel Harford. Davey is set to join gun duo Darcy Vescio and Tayla Harris in a star-studded Carlton forward line, with Harford set to shift his skipper from her customary position across half-back to a new role as a deep forward. The 24-year-old is back in full contact training, having ruptured the ACL in her right knee early last year, and is on track to feature in the club's round one encounter with North Melbourne next month. She expects to play limited minutes in a practice match against Geelong at Ikon Park on Saturday morning, where she will be trialled in her new role for the first time. "It'll be a bit different to what I've experienced in the past," Davey told AFL.com.au. "Even coming from soccer, I've always been in defensive positions. So, for me, it's probably about switching that mindset a little bit and learning a new role. "I feel like it's coming along nicely. I'm loving it so far and there's a great bunch of girls up there. They've taken me under their wing, so hopefully I can play a role up there." Davey, confirmed as Carlton captain for a second successive season on Wednesday, joins fellow marquee Vescio and high-profile recruit Harris in a talented Blues forward group. Vescio, included alongside Davey in Carlton's six-player leadership group for the first time in her AFLW career, is coming off an impressive VFLW season in which she kicked 26 goals from nine games to claim the League's leading goalkicker award. The highly skilled forward believes Davey will add a new dimension to the attacking unit. "Bri's got a lot of flair about her game," Vescio said. "You see glimpses of it in the backline. She can get quite creative. So, in the forward line, she's got full rein to show every trick in her book. "I've always known Bri as a midfielder from her VFL days, so I feel like she can bring a lot more attack into her game while still having that defensive mindset. "She can probably teach us a lot more about defensive pressure in the forward line as well, so I think it will be really good. She'll be a great addition." Davey's impending move forward comes after a sorry 2018 campaign for Carlton, who averaged just 24.7 points per game – clearly the fewest in the competition – to finish in last on the AFLW ladder.